I wore this outfit to go to a quaint French restaurant that looks like a tiny castle in North Hollywood. I selected the restaurant because it was listed as one of the few places that still has really good beef Wellington (one of my favorite dishes) and it just so happened to be about five minutes away from a gorgeous purple rainbow wall that's been on my L.A. wall list for quite some time. I discovered the wall on another blogger's "wall guide", which was convenient because it provided the exact location for the spot, taking a lot of guesswork out of the equation...or so I thought. Well, the fact that my wall couldn't be found was really irking me. Did they paint over it? Did the blogger give me the wrong address? I Google Earthed the location and saw that there was a bike path on the other side of where the apartments were and I remembered noticing something like a bike path when we were there. Then all of the pieces started to come together: the bike path was where all the murals were and I didn't realize it at the time! I felt like the Miss Marple of colorful blog wall mysteries! I am resolved this spring to come up with my own wall guide for the LA area and I think as a result of this experience I am going to add helpful tips like parking or heads-up about walls that are hidden on bike paths so that you won't have to do the detective work! 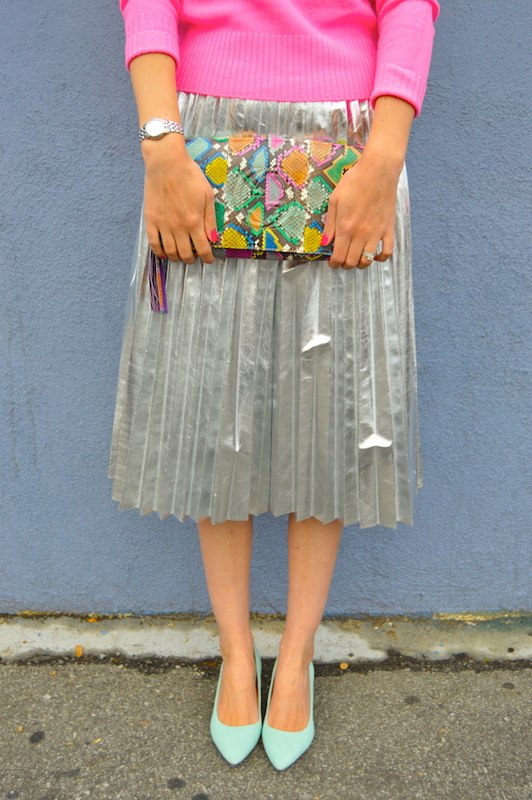 Such a fabulous outfit - the bag and necklace were made for each other! You did very well with the wall you did find, it's a great backdrop. Haha the crazy things we do for blogging! I love that shiny skirt! 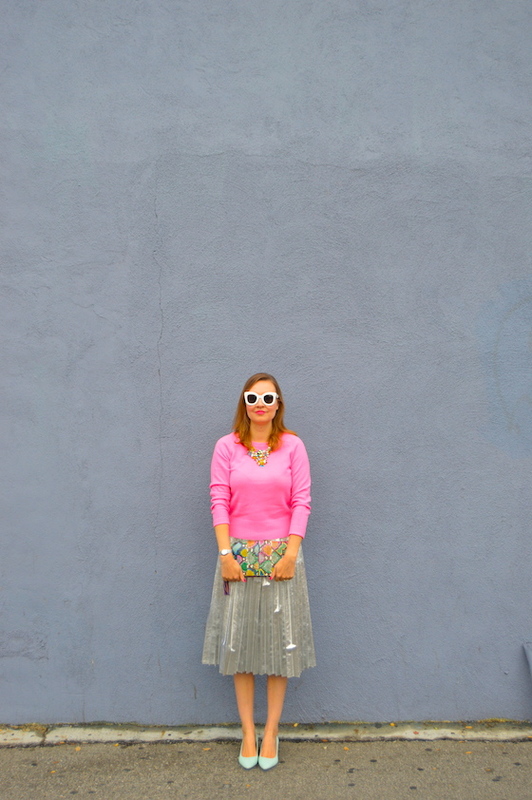 Shame you didn't get to find the wall you were looking for, but this one does work nicely with the pink knit! Beautiful and colorful as always. Love your skirt!! These pictures are fabulous. This wall works out perfect. Haha I love reading the saga of your wall searches! We don't have these kind of walls where I live, so it's a really interesting thing for me to read about. I love the shape of your sunglasses...so retro! I should get some myself in a few fun colors! I'm obsessed with that skirt and that sweater! 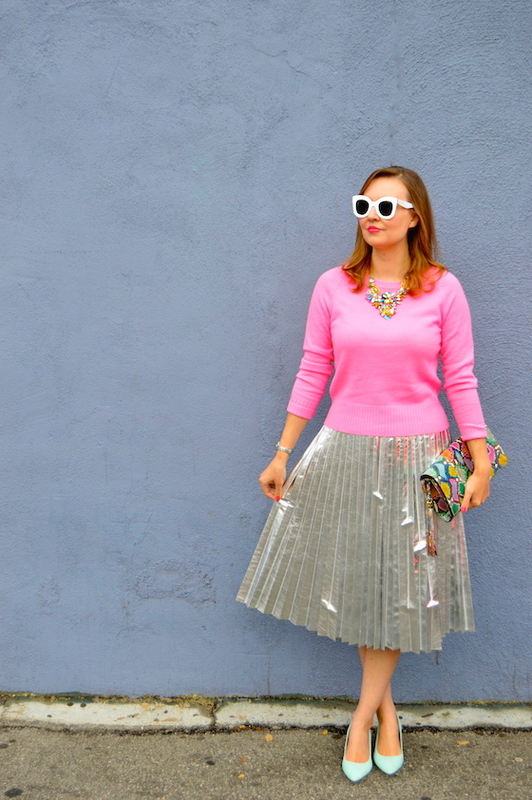 Pleated skirts are my weakness! I'm glad you solved the wall mystery, although I'm sorry that it was only after you had already left! 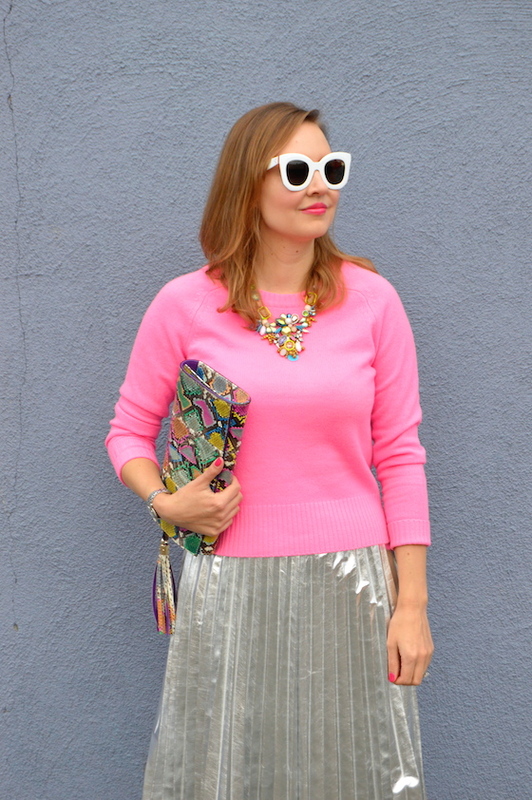 That skirt is fabulous--I love the metallic fabric and the fun pleats! Haha I love finding fun walls too! 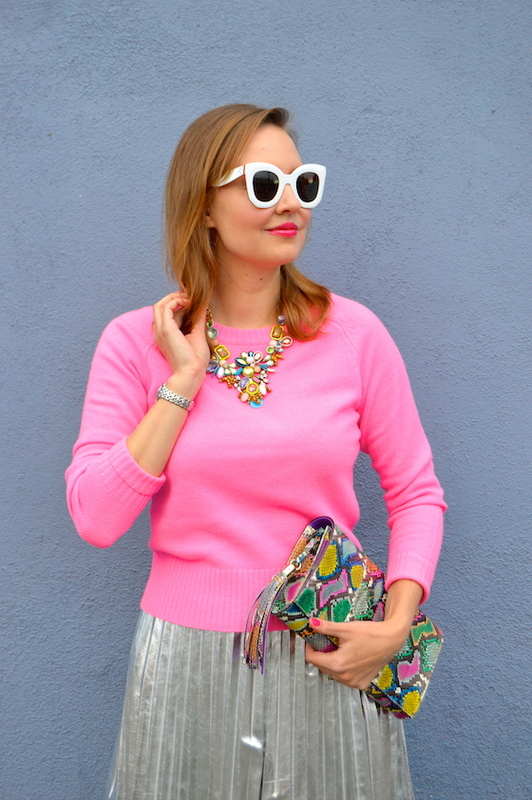 Love this pretty pink sweater! Love this pretty pink sweater! Beautiful combination of silver and pink! Your clutch bag is so gorgeous! That skirt looks great and it goes well with the wall. The tiny castle restaurant sounds so cute. Hah so great! The wall turned out to be fabulous....so funny it's right by a Taco Bell. You look great and I love the pink sweater! Too funny about editing out the Taco Bell lights! That skirt is gorgeous! 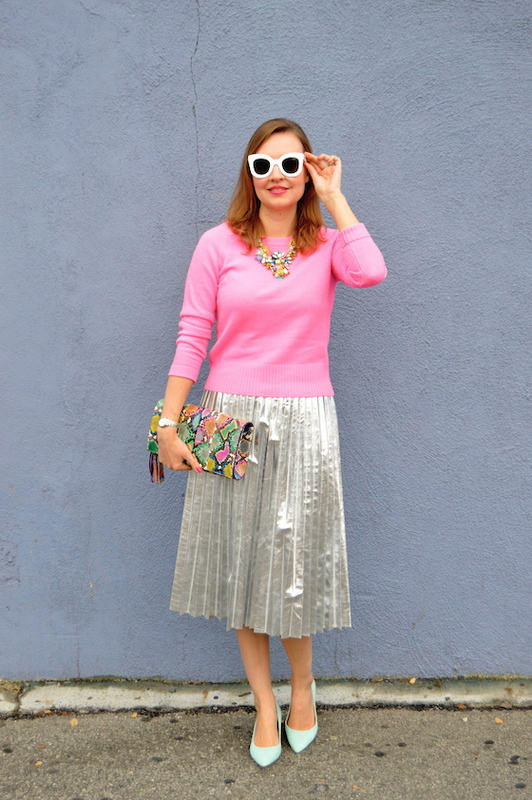 I love the bright colors and metallics paired together! There are so many cool walls where you take pictures. I like the color here as your outfit pops! The beautiful colors in your necklace show off your bag too!